If you are like me, your computer isn’t exactly the greatest machine of all time. As such, voice chat may not be an option in many games as it slows down your framerate too much to actually enjoy the game. Thanks to Gliby and his Voice Chat Mod, this is no longer a problem! … Which brings me to another point. 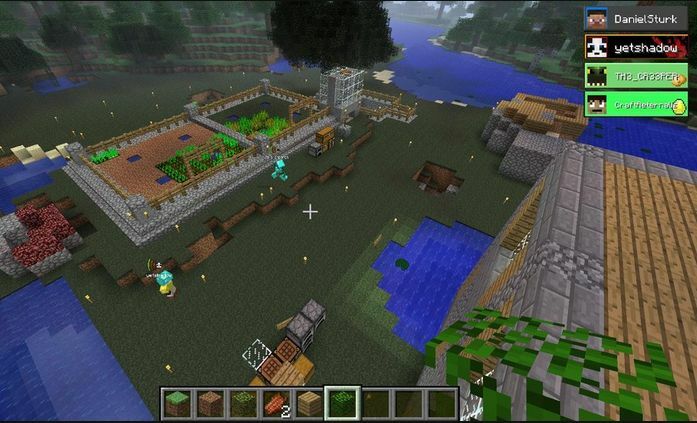 This mod utilizes the same logic that mobs in-game do to produce 3D sound! You may be most familiar with this method thanks to Minecraft’s zombies who groan far off in the distance while you are mining. As long as you have two or more speakers, you will be able to discern where the voice is coming from in relation to your character. To that end, players must also be near each other to hear each other with 3D voice chat enabled. Global voice chat can be used instead, but in general, 3D voice chat is recommended for servers or locally hosted games with larger numbers of players. Some commands and options are available as well, allowing the operator of the server to mute or ban annoying players from using voice chat, as well as providing all users with the ability to customize their audio input. Options are available by pressing the period key. You will notice that players who are speaking are shown in green on the top left, while inactive players are grayed out. That’s all there is to it! This mod is simple to use and quick to set up; for anyone who likes to voice chat, it is a great addition to the game. Even if you use Skype, the features and 3D voice option makes it a far better alternative, especially for servers. Download the latest version of Gliby’s Voice Chat. Games and voice chat have a notorious history for providing great laughs and wild adventures. Do you have any hilarious stories to share? Leave them in the comments!